Stufen, the book of poetry by Hermann Hesse which Insel published in 2011, is a new edition of a book which appeared in 1970 and that was originally published in 1961 as Stufen: Alte und neue Gedichte in Auswahl. As noted in the blurb, this is a collection of Hesse’s poems he selected himself a year before his death in August 1962, but it also features the three versions of ‘Knarren eines geknickten Astes’, a poem on which he was intent on working during his very last days. The anthology is chronologically arranged and spans his entire lyrical output, which is closely connected to his prose fiction, as a number of lyrics show. ‘Auf Wanderung’ echoes the state of dejection experienced by Knulp, a character we recognise from Hesse’s 1915 novel Knulp, at the end of his life. A sample from Hesse’s lyrical diary during much of 1926 (Krisis), where he elaborates on the themes that will eventually inform Der Steppenwolf (1927), also makes its way into the collection (e.g. ‘Steppenwolf’, ‘Die Unsterblichen’). In the section ‘Gedichte des Sommers 1929’ (see ‘Gedenken an den Sommer Klingsors’), Hesse looks back at the summer of ten years earlier, when he wrote the novel Klingsors letzter Sommer. Das Glasperlenspiel appears with a selection from the ‘Joseph Knechts hinterlassene Schriften’, which includes one of Hesse’s most celebrated poems, ‘Stufen’. The chronological arrangement reveals not only traces of Hesse’s novels, but also the development of the poet as well as the existential trajectory of the man. More than his prose fiction, Hesse’s poetry betrays the strong autobiographical imprint of his art, where it is sometimes difficult to distinguish the artist from the man and his passions, whether for Hölderlin (‘Ode an Hölderlin’), whistling (‘Pfeifen’), or butterflies (‘Blauer Schmetterling’). Stylistically, the poems progress from Hesse’s short early compositions, with stanzas almost invariably made of quatrains, to his later, more sophisticated lyrics, where the conventional cross and envelope rhymes, as well as rhyming couplets, all of which Hesse makes extensive use of in his poetry, give way to more complex rhyme patterns (e.g. free verse) as in ‘Louis Soutter’. 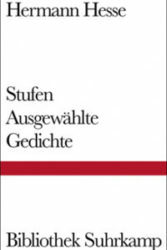 The major themes of Hesse’s poetic world find expression in the pages of this volume: memory and childhood (‘Rückgedenken’, ‘Zu Jugendbildnissen’, ‘Aus der Kindheit her’); the Orient and its spirituality (‘Bhagavad Gita’, ‘Der erhobene Finger’); music, as in the three ‘movements’ of ‘Feierliche Abendmusik’; nature (‘Tag im Gebirg’, ‘Leben einer Blume’); and death (‘Bruder Tod’). The poems also seek to illustrate the coincidence of the inner dimension of the self and the outer reality of the world, as in ‘Weg nach Innen’ or ‘Adagio’, where Welt und ich ist eins, and stress that conventional opposites such as life and death, day and night, male and female, or Traum und Tat are interdependent. It is only love which rarely surfaces in this collection (‘Lulu’, ‘Liebeslied’), probably due to Hesse’s mature perspective on the subject at the time he was working on the anthology. Of all the themes this collection deals with, it is aspects of time that stand out as Hesse’s overarching concern. A temporal indication often appears in the titles, from the early ‘Dorfabend’ to the late ‘Müder Abend’. Several poems draw on the contrast between the fleeting Unseres vergänglichen Seins (‘Unterwegs’) and the eternal Uferlose Zeiten (‘In einer Sammlung ägyptischer Bildwerke’) and attempt to portray their ideal reconciliation in the form of an everlasting transformation: ewige[s] Wandel (‘In Sand geschrieben’). Time bestows the joy of a new awakening in ‘Morgen’ and, through a personified ‘Frühling’, can render the Earth a holde Heimat, yet also, like the titan Kronos in Greek mythology, it devours what it has formerly generated, and its destructive power effaces the beauty of the frescos in the Santo Stefano Church in Venice (Die Bilder fraß die Zeit). Time is the domain of memory, which seeks to preserve the past glory of a venue (‘Roter Pavillon’, ‘Gartensaal’) or recapture the lost dimension of the poet’s childhood: ‘Frühlingstag’, ‘Beim Wiederlesen des Maler Nolten’. Hesse’s preoccupation with time intensifies in his later years, and the temporal often surfaces in combination with an attention to the meteorological: ‘Märzsonne’, ‘Gewitter im Juni’, ‘Regen im Herbst’ (from the section ‘Die Späten Gedichte: 1944 bis 1962’). Hesse’s dialectical understanding and relation with time is exemplified by those poems which portray the passage from one stage of life to another or from one season to another (‘Verfrühter Herbst’, ‘Vorfrühling’, ‘Spätsommer’). As in ‘Stufen’, much of Hesse’s poetry dwells on a moment of transition and is suspended between Abschied and Neubeginn, vergehen and auferstehen; in his lyrics, the light of the day often wanes (‘Weisse Rose in der Dämmerung’, ‘Spätblau’) or is captured a moment before it resurrects (‘Frühe Stunde’, ‘Licht der Frühe’). The ability to express an interdependence of opposites and modulate the passage of time through the transition between day and night, beginning and end, life and death (Trüber Rauch nur ist der Traum vom Tod, / Unter dem des Lebens Feuer loht), with ever new nuances, is probably the most remarkable achievement of these poems, and of Hesse’s art in general. Hesse’s poetry did not enjoy much praise from his contemporaries. Rilke responded rather tepidly to Hesse’s lyrical production, despite his initial overt encouragement to the young author of Eine Stunde hinter Mitternacht (1899), and the limitations of Hesse’s lyrics are apparent to the modern reader too, who often discovers an either over-sentimental tone (Entreiß dich, Seele, nun der Zeit, / Entreiß dich deinen Sorgen) or an unoriginal use of prosodic elements for a twentieth century writer. The general artistic lure of some of Hesse’s poems is fading away; however, they maintain an exceptionally powerful human appeal, especially where Hesse’s love of life emerges: Und jedes Lied und jedes Buch / Und jedes Bild ist ein Enthüllen (‘Sprache’). At its best, Hesse’s poetry is able to express the eternal round dance of life and death (De[r] unendlich[e] Todesruf, / de[r] unendlich[e] Liebesruf) and voice a joyous acceptance of the difficulties connected with das Heut und Hier.